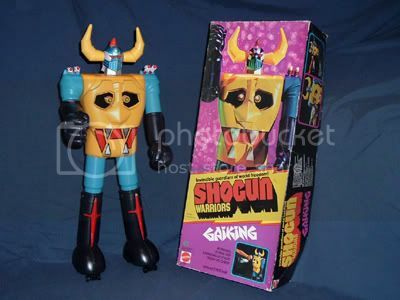 Shogun Warriors-"Invincible Guardians of World Freedom!" 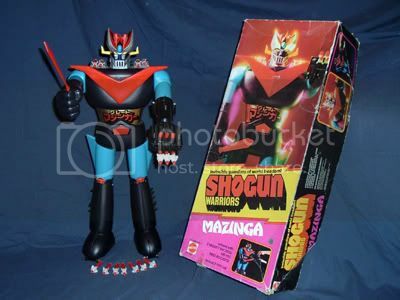 I have had some email commenting on the Mazinga Shogun Warrior that is prominent in my Toys 2 Remember banner and picture on the previous post. Wow, remember how cool they were? 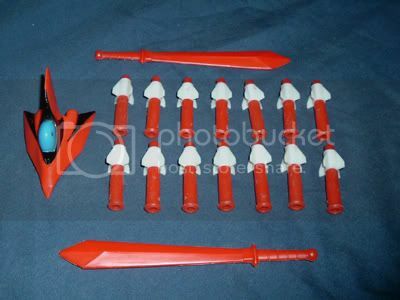 We had many of the smaller diecast metal figures, but the best by far were the 24" Jumbo Machinders. The way they fired rockets, shooting stars, missles or even their fists was pretty cool in the eyes of a 10 year old boy! Luckily for us the time was before the "projectile ban" on toys. 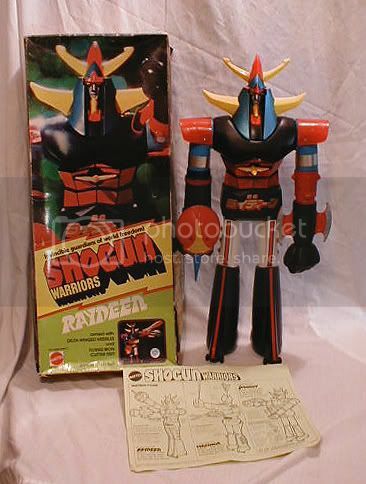 There is a lot written about the Mattel Shogun Warriors if you want to know more details. 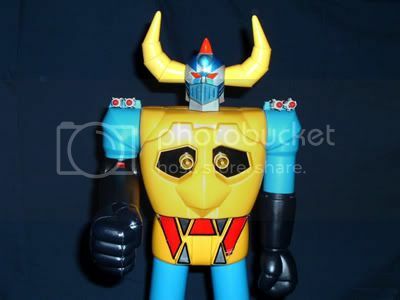 One good site about Shogun Warriors (amoung other toys) is WildToys. 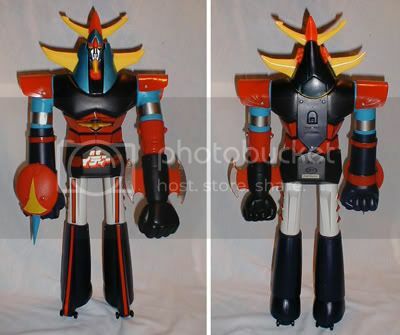 Our favorite thing about Mazinga was his accessories: His rockets, swords and his "spaceship brain"! Raydeen shot little yellow airplane shaped missles from his chest and his left fist! The way Dragun looked probably mad him my favorite. He shot, or rather "flipped" battle axes from one hand and shot stars from a contraption strapped to his other hand. Godzilla is probably the most sought after now, but he was the first one I parted with because I never thought he fit in with the others. I was never impressed with his "fire breathing" which actually looked like he was sticking out his tounge. 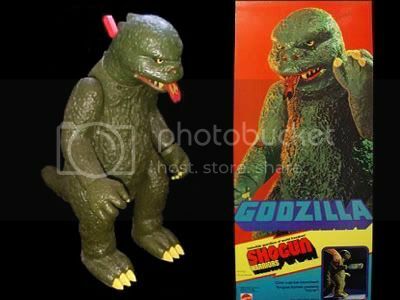 And I never saw a Godzilla movie where he fired his fist, but the Shogun Warrior Godzilla's fired fast and furious! 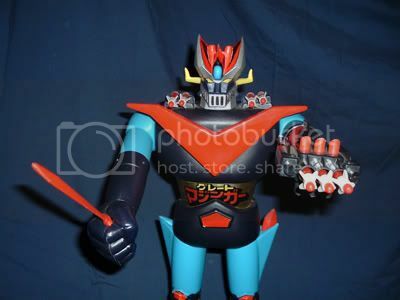 Last but not least is Gaiking. A sort of funny looking warrior, but what he was lacking in looks he made up for in fighting ability! 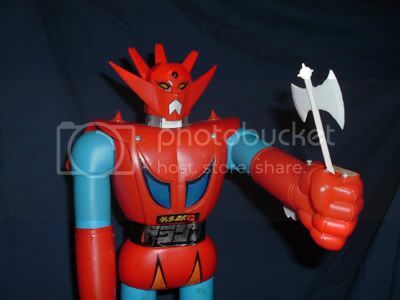 He shot his fist as well as Mazinga-like rockets from his chest. 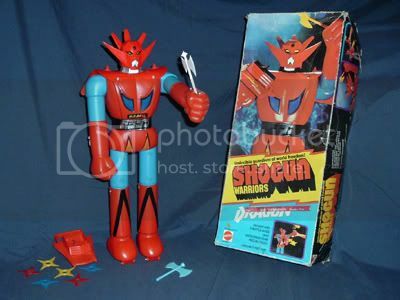 So the only Jumbo Shoguns not pictured here were Daimos, Goldorak and Rodan. All three look odd to me since I do not have any memories of seeing them and/or playing with them. As for the others, I saw them a lot! 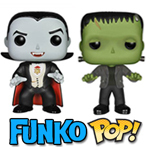 How can you not when they are each two-foot tall! Wow, There's just nothin' like 'em!! !